If you're one of the 29.5 Bazillion viewers of American Idol weekly or The Grammy's annually or hundreds of other TV shows, musicals or concerts, this fine lookin' group below are the ones responsible for the sound/audio you hear on those productions. Paul Sandweiss, 2nd from left in the rear and his group has been booking their golf trip with me to Palm Springs for a couple of years now and they're great guys to deal with. They haven't actually faxed signed, eraser smudgefree scorecards to me as of yet, despite my requests, but they have dropped thank you notes and have had always had a great time staying for a few days and enjoying the golf and sun in Palm Springs. So next time you watch American Idol, say thanks guys and good golfing! 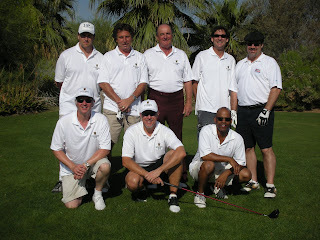 Back Row L to R: Mikael Stewart, Paul Sandweiss, David Bellamy, Danny Harris and Scott Harmala. Front Row L to R: Andrew 'Fletch' Fletcher, Michael MacDonald and Mike Parker.